Spillways rein huge in importance to life, or death, of a pond. This mechanical spillway is doing its job. Sometimes we feel like preachers at a pond-building pulpit. Preaching the proper way of changing pastoral settings and eroded wastelands into primo ponds. 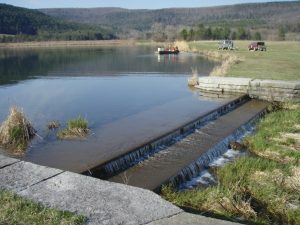 Dams, pipes, and spillways dominate the early part of each pond building project. Especially spillways. Today’s sermon is about spillways, from the book of water management. First, here are a few terms. A primary spillway takes care of normal rainfall events…whatever normal means. 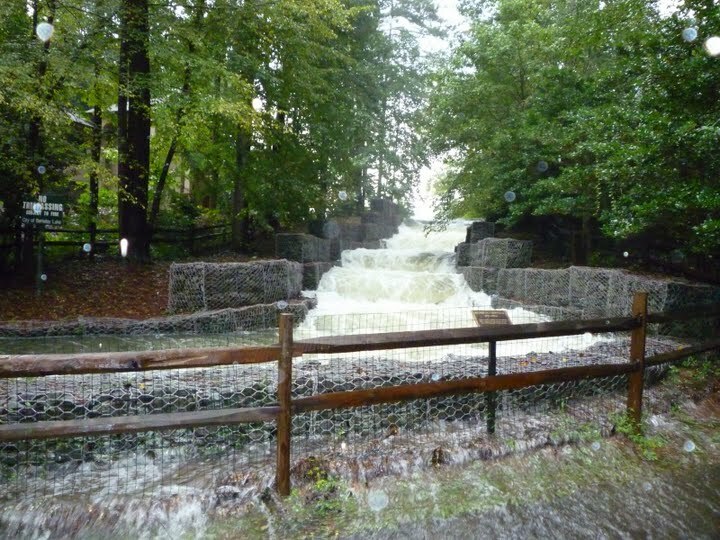 Secondary, or emergency spillways, are designed to take care of those big rains, such as a one-hundred-year event. For the sake of clarity, a one-hundred-year rain event doesn’t happen every hundred years, it simply has a one percent chance of happening during any given year. 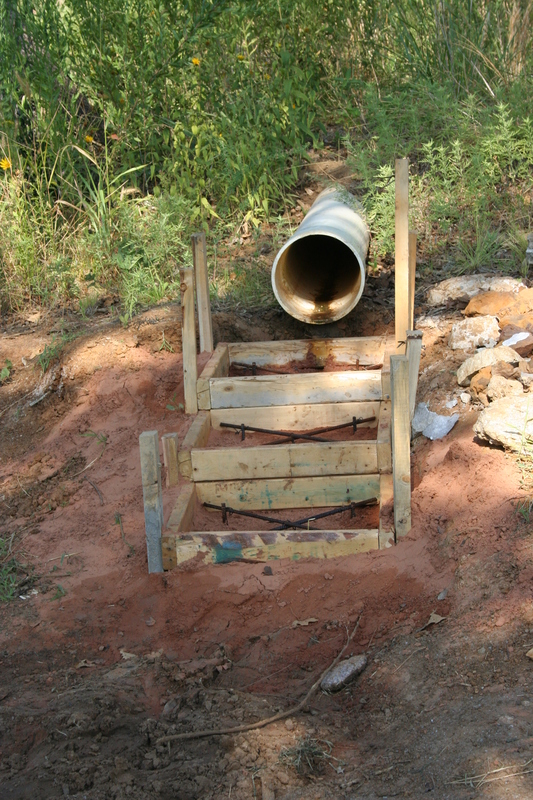 Pipes are often designed and engineered to rid a pond of excess water from normal rainfall. But, emergency spillways are charged with the orderly exodus of big rains. Torrents, floods. Stuff from Noah’s lifetime. Spillways rein huge in importance to life, or death, of a pond. When those inevitable giant rains come, your spillway better be prepared. It’s like a third string quarterback on the football team. He doesn’t play much, but when he does, he best be prepared to be the hero. 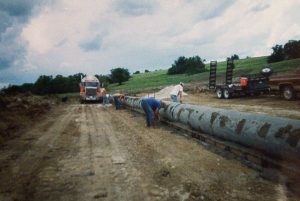 Installing a large pipe in a good-sized lake. This will be the primary spillway for this water body. People become excited about giant fish, fish structure, clean, clear water. But, all of those good feeling things can go away with one big rain, if the spillway is inadequate. Spillway should be at the genesis of your project. Before a spade of dirt is turned, you should have a solid grasp where the spillway should sit, how large it should be, and where it directs excess water. How do you figure out how large your primary and emergency spillways should be? 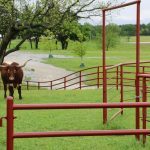 Former Pond Boss magazine editor Mark McDonald tells a story of big rains swallowing a lake he owned in the Texas Hill Country. The forty-acre flood control reservoir ballooned larger than 90 acres during a one-hundred-year rainfall event years ago. Water rolled over the massive spillway, a foot deep…seventy feet wide. Had anyone dared attempt to walk across that raging torrent, they would have been instantly swept away. But, the spillway did what spillways do; orderly releasing massive amounts of water, without disrupting the integrity of the lake. Several days later, McDonald’s lake was back to its normal elevation, and soon after that, back to its normal color and activity. Standing along the shoreline, looking at leaves, twigs and twisted debris twenty feet high in dry land trees was a stark reminder of the power of water. Small ponds with small watersheds can be serviced by this eight-inch pipe. Spillways can be made of concrete, earth, rock…but design, and materials, should be well thought out and engineered to the specific situation. Most spillways for most ponds are made of dirt. Earthen spillways typically sit at the end of the dam, with terraces extending well beyond the back toe of the dam, typically releasing water into the same creek or waterway that was dammed in the first place, as far away from the dam as possible. Earthen spillways have the gentlest slope possible, to allow water to move as slowly as possible. 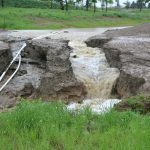 Simply speaking, your spillway should be built large enough to handle all the water that comes from the biggest rain you will get. If water ever goes over the top of your dam, you’re most likely going to build a new dam. At the least, you will be the honored guest at the biggest repair job party ever. Spillway size and design is a function of math. That’s right, arithmetic. Figure out watershed size. That’s job one. Then, learn what a hundred-year flood is for that part of the world. A hundred-year flood in Phoenix isn’t the same as one in Omaha. Then, calculate the volume of water your spillway must accommodate during that big rain event. Remember this, one acre, one-inch deep, is 27,000 gallons. Multiply that by the inches of rain, and then multiply that number by the number of acres funneling water into your pond site. Now, you understand how many gallons of water your pond or lake has to accommodate. Next, either you or an engineer needs to figure out how wide your spillway must be to allow that water to flow out in an orderly fashion, and not be much deeper than six inches. That’s a well-designed emergency spillway. Here’s something else important about spillways. Your primary spillway will sit at water level if it is a pipe. 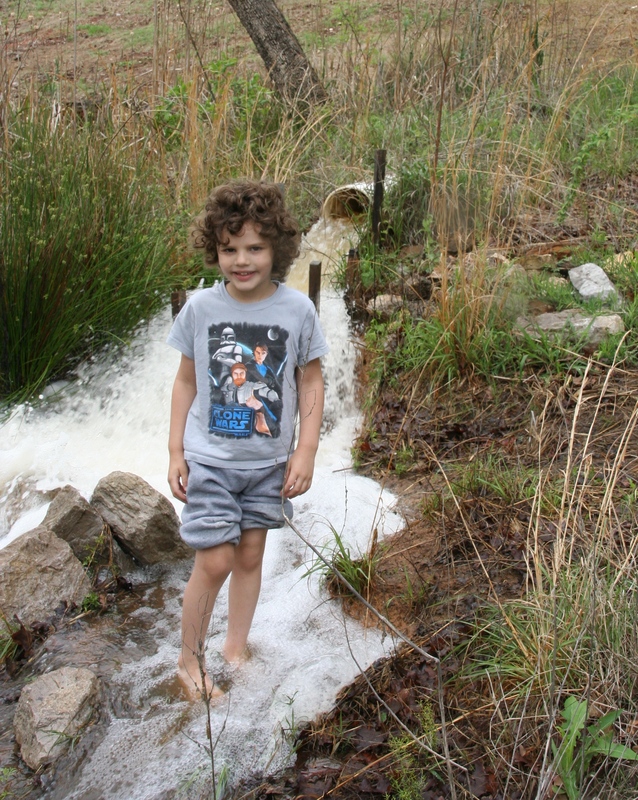 When your pond is full, water may trickle over the pipe and down the creek. The secondary, or emergency spillway, should sit two to three vertical feet above the primary spillway elevation. Then, the top of your dam should sit another two to three feet above that emergency spillway to keep your dam from being topped. If water flows over the dam, it is likely to burst. A combination mechanical and earthen emergency spillway. All water coming down a creek must enter the neighbor’s property through the same creek. We can’t build a lake or pond which moves water that comes down a creek into our lake, around our spillway, and move it into another creek, or watershed, if it leaves the property. Water has to leave in the same place from whence it came, unless we get landowner permission. Here are a few facts for your consideration. 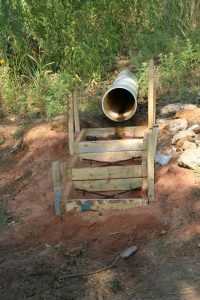 Dirt spillways are cheapest to build, but have maintenance issues from time to time. Expect erosion, expect to repair. During the huge floods in north Texas during spring of 2015, we saw spillway after spillway being tested. That time period saw flooding rain after flooding rain, for 40 days. Northern Texas and southern Oklahoma saw from 40-60 inches of rain during that span. Famous bass angler Jimmy Houston, lost his dam. That lake covered 100 acres. The spillway couldn’t handle what was eventually determined to have been a five-hundred-year flood. Spillways need to release water far enough away from dam to keep from swirling and washing away the backside slope. Small terraces can keep water from washing away the backside slope of the dam. Look for “natural” spillway areas. If you can find a gentle, vegetated slope, consider turning water loose there. Looking for a natural spillway can be very valuable to save lots of construction costs and later maintenance. The eight-inch pipe is doing its job. Vegetate the spillway. Talk with experts for your area. Some areas plant Bermuda grass, others have rye, other bluegrass…some type of ground covering, thickly rooted plants. Heavy vegetation allows water to soak, with less runoff. Upstream, other ponds can slow water movement into your pond, as well as hay meadows with tall grass in the watershed. One the other side of the equation, steep slopes with lots of rock move lots of water, it will not soak. And, rainfall off rock, pavement or rooftops, moves more water quickly. More water into lake means more water into and over the spillway. Here we go, back into the spillway. Urban areas must consider mechanical spillways. The best place for a spillway there may not be at the end of a dam, especially in an area ripe for development where that land may be more functional as a home site. In that case, a concrete spillway is a good choice. Expensive, but good. Good because water can be directly released where it needs to flow…immediately back into the creek from whence it came. Sound like a broken record? Other mechanical spillways can be made of rip-rap, baffles or dad’s first Dodge. Here’s your bottom line. It doesn’t matter how good your lake is or how well your dam is constructed, without a good spillway, all could be lost. Improperly built spillway, not vegetated, quickly eroded. Big repair here. In the background, this spillway is doing its job. This entry was posted on Monday, December 18th, 2017 at 1:38 am	and is filed under Articles, News & Updates. You can follow any responses to this entry through the RSS 2.0 feed. Responses are currently closed, but you can trackback from your own site.